"This proudly independent nation that remained neutral even during World War II"
Some UK journalists still praise Sweden's "neutrality", arguing this stand guarantees a "fair trial" for Julian Assange , and that a request for his extradition to the US would be processed equitably and respectful of human-rights. For their part, the Swedish government insist their stand is "non-aligned" and - echoed by the media - they repeat to the Swedish people that Sweden's commitment in Afghanistan is due solely to obedience to United Nation resolutions, and that they send troops there after a UN "mandate". In true there is no such absolute mandate from UN for countries to support with troops the USA-lead military occupation of Afghanistan. Instead, there is a UN absolute ban against torture, and which Sweden have violated, repeatedly - and got sanctions for - such as in the case when Sweden granted to USA the illegal clandestine extradition of political prisoners from Sweden (the "extraordinary rendition" episodes). Sweden is NOT neutral, and is not "militarily non-aligned", as the government print in their official website with regard to their NATO collaboration. More over: Sweden's international political behaviour during the post Olof Palme era portraits a noncritical, unilateral, Yes-sir vassal-state. All which does Swedish pompous declaration of "non-alignment" a blunt contradiction of terms. This is a central aspect to bear in mind on the extradition issue of Wikileaks founder Julian Assange. This is article does not intend to "reveal" that Swedish is not neutral, which is already known by apparently everybody except for a variety of Swedish and UK journalists. This, judging from their continuously negation of the real character of Swedish geopolitical stand, including its military endeavours. UK Journalist Claire Harvey has stated, for instance, that Sweden is a neutral state. She is very convinced about that and even ground on such assumption her ridiculing of the warnings stated by Julian Assange and Wikileaks folks' regarding the risk of a prompt extradition from Sweden to the USA. I have analysed this issue in more detail in the article Sweden will grant extradition of Assange to the US if not stopped by international political pressure. Here, I will provide other illustrations of such veritable alignment of the Swedish government towards their US counterparts, and which started appearing evident already during the Bush administration, respectively the Swedish social democratic government of Göran Persson. An illustration of the intimacy of this collaboration, measured by formal rewards, is the NATO medal (pictured above). It is given to all soldiers "that have served at least 30 days in non-5-article operations under NATO command" Source: Swedish Armed Forces . These means: All soldiers in the Swedish occupation forces of Afghanistan. The Swedish military in Afghanistan operate in reality under USA command. Medals may be symbols, but military occupations are not. And their collateral damage on the civil population can result devastating, regardless if unintentionally produced and that civilian populations are in fact not a target of such occupations. Nevertheless, a panorama of these human tragedies damage can be spotted in the Wikipedia page civil-casualties in the Afghanistan war, including those in territories militarily occupied by the Swedish troops. The extent in which the civil population of Afghanistan is suffering because of the above it should be taken into serious account by people like the Swedes, which on the other hand are praised to embrace peace and understanding. In fact, my opinion, as I stated in an answer twittered some days ago, is that the international prestige of Sweden has been hijacked by a bunch of irresponsible politicians covered by another bunch of unprofessional journalists. But that I am certain the Swedish people will recover it from them. Meanwhile, the Swedish government have never clearly publicly acknowledged the real extent of such collaboration in the geopolitical all-level. The Swedish journalists and "analysts" from their part fail to connect this military alignment - in fact pursued in different world scenarios - with the political stands Sweden has maintained in the last years at the UN and other international forums. There is hardly one position voted by Sweden that has not been that one of the USA. The US Ambassador in Stockholm would have informed to Washington (according to the Wikileaks diplomatic-cable mentioned below): the Swedes have "left neutrality in the garbage-trash". Instead, the Swedish government still maintains in their website that the such Swedish "cooperation" is "based in Sweden's policy of military non-alignment"! The argument that Sweden has "always stand up for United Nation resolutions" (which is in itself untrue) was also used by the Social democratic party during the debate in the Swedish Parliament regarding the direct participation of the Swedish Air Force in the recent events of Libya. In fact, all the political parties, from right to left in the Swedish Parliament (including the Vänster party and the Gröna) - with the solely exception of the Sverige demokraterna PM's - approved the government's proposition for such participation in the Libya operations led by NATO. The above mentioned shadow Foreign-Affairs minister Urban Ahlin has also been disclosed in the Wikileaks diplomatic cables. The right-wing tabloid Expressen run at that occasion an article with the heading "Wiklieaks discloses: Ahlin wanted to sell the (Afghanistan) war to the Swedish people in this way". Namely, Urban Ahlin had asked at a meeting in the US Embassy in Stockholm, that US should send to Sweden a local politician from Afghanistan in order to tell the Swedes "affective-impacting" stories. This would further increase the support from the Swedish people, reasoned Ahlin. Urban Ahlin has of course denied that such conversations had occur and called the all thing "Wikileaks' lies". And nothing happens afterwards; he is still Sweden's shadow Foreign-Affairs minister. 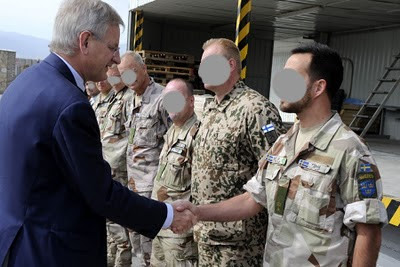 The actual Swedish Foreign-Affairs minister is seen here in the picture below greeting "militarily non-aligned" Swedish troops (under USA command) in Afghanistan. See other details of the non-neutrality issue with regard to the request for the extradition of the Wikileaks founder Julian Assange in Sweden will grant extradition of Assange to the US. If not stopped by international political pressure. Insatserna i Kosovo (Kfor) och i Afghanistan (Isaf) är så kallade ”non article 5” insatser (icke-artikel-5-operation). Det vill säga det är Nato-ledda operationer under ett FN-mandat. 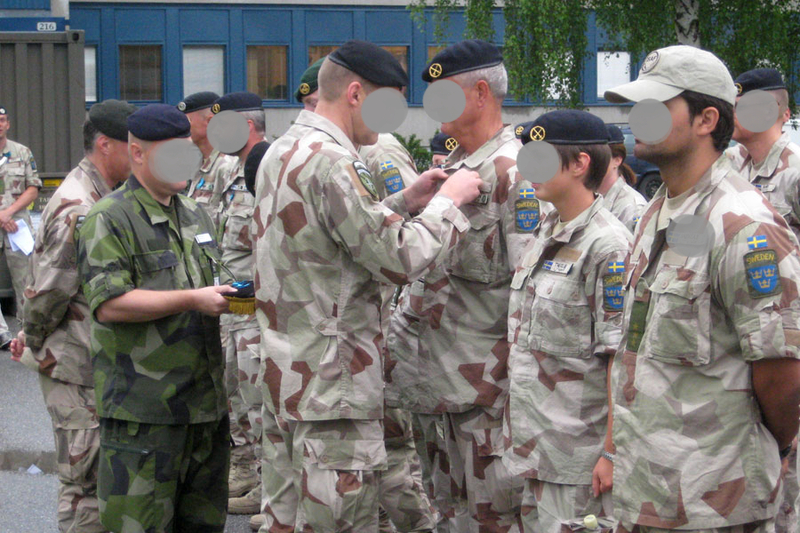 När man som svensk soldat tjänstgjort minst 30 dagar i en icke-artikel-5-operation i Natos regi så får man en särskild medalj för det. 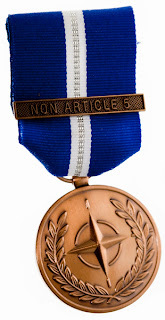 På medaljens framsida syns Nato-emblemet i form av en kompassros. För insatser i Kosovo står det ”non article 5” på det blå och vita bandet och för insatser i Afghanistan står det ”Isaf” på bandet." Surely alarm bells would ring if people understood the cast of players for the prosecution, their ties to torture and the CIA. It would be interesting to see a list of those employed by the prosecution and a few key items from their history. It seems to me that the prosecution is stacked with very serious players, which is over the top given the minor nature of the accusions, given that the whole case was initially rejected, and given he is not even charged with an offence.